American Idol Season 12 Episode 2 “Auditions #2” VIDEOS HERE! 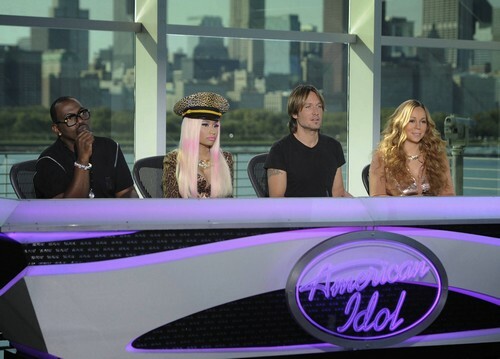 American Idol aired tonight with its final part of the season 12 premiere. If you missed the show we have some videos of the performances below for your enjoyment! MacKenzie Wasner from TN singing Whenever you come around by Vince Gill. Mariah thought she was awesome and loved her voice. She feels she has a star power. Nikki thinks that someone like her walks into the room once every few years. She just blew her mind. Randy loved the song and thought she did it justice. Keith thinks her voice had vulnerability. He thinks she has a great tone. They all give her a YES and she is headed to Hollywood! Kiara Lanier from Chicago – She starts by tells Mariah she made her want to sing and thanks her for having the opportunity to sing for her. She sings Celine Dion’s Prayer. The judges love it. Nikki tells her it was pretty frickin pretty. She had so much control. Randy tells her he loved it to. Mariah tells her she has lots of potential and loved the way she went from loud to soft. Keith tells her she looks great, she came to be a star. The judges all vote YES, she is going to Hollywood. Gabe Brown, from Iowa, a Rocker who is a Baker brought everyone cookies. He is singing a song by the Stones and he is bad, really bad. Good thing he brought cookies. Mariah asks if he can do something softer, more mellow. He decides to do, “We all Die Young.” Randy loves the rock thing. Nikki believes him when he does his rock thing. They all vote YES, not sure what they were listening too. He was so so bad. Griffin Peterson from WI, who is singing “Wash By The Water” Nikki loved him. Randy thinks his voice is just below average. Nikki tells him he is wrong, the girls are coming to his concert. Mariah thinks there is potential because he has a very handsome face. Nikki says yes, Mariah says yes, Keith is away so he did not vote, Randy says no. 2 votes to 1. He is going to Hollywood. Stephanie Schimel, 20, Mariah liked her and liked her choice of song. Keith thinks she is like Gwen Stefani and Carrie Underwood. Nikki was not wowed, although she thinks she is pretty. She just does not look like a star to Nikki. Randy liked her. Mariah, Keith and Randy YES, Nikki, No. Three time YES, she is going to Hollywood. Curtis Finch Jr., 24, a tutor from MO – he is singing a God is Able. He was so good, very good. The judges made no comments they just all voted “YES,” he is going to Hollywood. Before he left he asked if his friend could meet Mariah Carey and they agree. Isabelle Parell she is 15 years old and she is skipping today. She is singing “Baby it’s cold outside” She is really, really good. Keith likes her voice. Mariah was very happy to hear a Christmas song and thinks she has a really sweet quality, an adorable quality. Nikki loves her tone and her attitude. Keith likes her voice and think her song was a good voice choice. Nikki, Mariah and Keith vote YES, Randy NO, but she has enough votes to go to Hollywood. Lazaro Arbos is from Cuba and he stutters. He does not have a lot of friends because of his stutter, so his music is his life. He is going to sing Bridge of Troubled Water. He sings beautifully. Keith tells him she should sing all the time. Randy loves his voice. Nikki thinks his story is very emotional. He sang one of Keith’s all time favorite songs. They all vote YES and he is on his way to Hollywood! Kez Ban is 27 – she is from North Caroline and she is a singer, song writer and guitar player. She is singing Pinocchio. She is odd, but she sounds good. They ask her to play her guitar and sing one of her songs. Randy likes her. Mariah loved the song she wrote and loved hear her playing the song. Nikki thinks she is very captivating and she took her into her world. Keith likes her voice a lot. They all vote YES, and she is on her way to Hollywood.